To Cite: Thodou V, Buechter M, Canbay A, Baba H A, Kalsch J, et al. De-Novo Autoimmune Hepatitis with Consecutive Acute Liver Failure Induced by Hepatitis E Infection: A Case Report, Hepat Mon. 2017 ; 17(3):e40744. doi: 10.5812/hepatmon.40744. A 49-year-old male patient was referred to our institution for acute liver failure (ALV). Apart from cholestasis, coagulopathy, and hepatic encephalopathy (HE) I°, laboratory studies revealed a significant increase in liver enzymes with an alanine aminotransferase (ALT) level of 4’108 U/L and an aspartate aminotransferase (AST) level of 3’878 U/l (normal < 50 U/L), a constellation essentially compatible with autoimmune hepatitis (AIH). Work-up of serological markers for hepatitis E (HEV-IgM and PCR) was at the same time positive. Furthermore, the patient was strongly positive for antinuclear autoantibodies (ANA) with a titer of 1:1’280 (normal upper limit 1:80), and also presented hypergammaglobulinemia (immunoglobulin IgG-level of 21.3 g/L; normal 7, 0 - 16, 0 g/L). Liver histology demonstrated massive hepatitis and necrosis with the presence of plasma cells. Due to the diagnosis of de-novo autoimmune hepatitis, therapy with steroids was performed despite the evidence of acute HEV-infection. It was of great importance that the patient recovered completely while neither antiviral therapy with ribavirin nor liver transplantation (LT) was necessary in the further course. Acute liver failure (ALF) is a potentially reversible dysfunction of the liver with symptoms such as jaundice and coagulopathy as well as rapid development of hepatic encephalopathy (HE). It is a rare condition with a prevalence of 5 per 1 million people and a considerably high mortality rate up to 34%. The main cause of the disease in developed countries is drug-overdose (especially acetaminophen) and viral hepatitis. In Germany, drug-induced ALF is the most common cause of the disease with an incidence of 32% followed by viral hepatitis with 21%, while the cause remains unknown in 24% of cases. Autoimmunity as a cause of ALV is rare (1). However, in all cases, it has been observed with widespread hepatocellular necrosis beginning in the centrizonal distribution and progressing towards the portal tracts. Degree of parenchymal inflammation varies proportionally to duration of the underlying disease. The reduced production of coagulation factors leads to a high bleeding tendency. Due to the loss of detoxification, serum ammonia and bilirubin levels are remarkably high (2). Hepatitis E virus (HEV) is a small RNA virus responsible for acute hepatitis which occurs epidemically in Asia (by genotype 1 and 2, epidemic form) or sporadically in industrialized countries (by genotype 3 and 4, autochthonous form). The latter form of hepatitis E is usually subclinical and mild, particularly in women and young people. However, it has a striking spectrum of serious complications including “acute” and “acute-on-chronic” liver failure. This refers to hepatitis with rapid deterioration of liver function in individuals with pre-existing liver disease. The pre-existing liver disease may be subclinical and often unsuspected (3). Viral-induced de-no autoimmune hepatitis is often reported following EBV-infection (4). However, acute liver failure by hepatitis E virus with the onset of autoimmune hepatitis is a rare condition (5, 6). A 49-year-old male Caucasian patient was referred to our institution for acute liver failure in June 2014. The patient had no past medical history of any liver disease. Anamnestically, symptoms started two months ago after a trip to Egypt. Physical examination on admission revealed jaundice and hepatic encephalopathy. The patient complained of fatigue and pruritus; arthralgia was denied. Laboratory studies (Table 1) revealed acute liver failure with a total bilirubin of 25.8 mg/dL (normal 0.3 - 1.2 mg/dL), aspartate aminotransferase (AST) level of 3.878 U/L, alanine aminotransferase (ALT) level of 4.108 U/L (normal < 50 U/L), and pro-thrombine index of 45% (normal 70% - 130%). Serological markers of hepatitis A-D, Epstein-Barr virus (EBV), and cytomegalie virus (CMV) infections were negative, though serological work-up of hepatitis E (IgM and PCR) was positive. HEV viral load revealed 3’900 copies/mL. Interestingly, the patient was at the same time strongly positive for antinuclear auto-antibodies (ANA-titer of 1:1.280) and demonstrated hypergammaglobulinemia and increased immunoglobulin IgG levels up to 21.3 g/L (normal 7.0 - 16.0 g/L). Further autoantibodies such as AMA, ANCA, SMA, LKM, and SLA were all negative. Blood cell count is shown in Table 1. Abdominal ultrasound examination demonstrated hepatomegaly. Following AIH scoring system, the patient achieved 7 points. Liver biopsy performed by mini-laparoscopy revealed acute hepatitis with the presence of plasma cells, periportal fibrosis, ductular proliferation, massive apoptosis, and necrotic vessels (Figure 1A and 1B). Abbreviations: ALT, alanine aminotransferase; ANA, anti-nuclear antibody; AST, aspartate aminotransferase; HE, hepatic encephalopathy; HEV, hepatitis E virus. A, Severe hepatitis with bridging necrosis is demonstrated. Arrow indicates central vein (original magnification × 200); B, Arrows indicate apoptotic bodies. Arrow heads indicate hepatocytes with severe cell swelling (original magnification × 400). Under the suspicion of acute liver failure as the first manifestation of autoimmune hepatitis triggered by hepatitis E-infection, steroid therapy with an initial dose of 500 mg prednisolone was started. 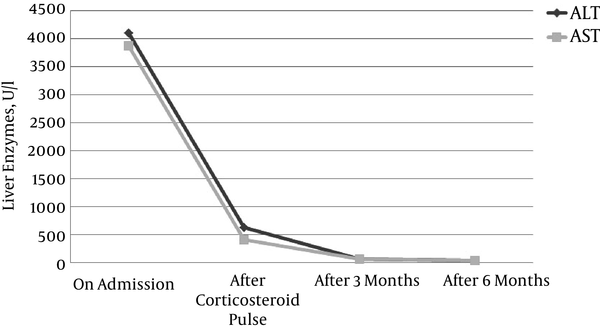 Steroids were tapered down slowly by scheme to 7.5 mg/day conservation dose. At the follow-up visit two months later, the patient presented excellent condition, had no complaints, and jaundice was no more detectable. Maintenance therapy with low-dose prednisolone of 5 mg/day was continued till present. Total bilirubin, transaminase levels, and pro-thrombin index were within normal ranges (Figure 2). Hepatitis E-PCR turned negative. Therefore, we did not start antiviral therapy with ribavirin. We herein describe a rare case of acute liver failure induced by HEV infection associated with de-novo autoimmune hepatitis. However, no liver diseases in our patient were known in the past. We speculate that the process of autoimmunity was activated due to acute HEV infection. Laboratory results of elevated transaminases as well as the strongly positive antinuclear autoantibodies with hypergammaglobulinemia encouraged the diagnosis of autoimmune hepatitis type I. Furthermore, serological work-up revealed acute hepatitis E infection at the same time. HEV is a leading cause of acute hepatitis in developing countries and an emerging causative agent of acute and chronic hepatitis in Europe (4-6). A recent study from the Robert Koch Institute found an anti-HEV prevalence of 16.8% in the adult population in Germany (7, 8). We thus have to assume an annual rate of more than 100,000 infections, over 99% of which are clinical unapparent. The reason why HEV infection turns to acute hepatitis with liver failure has not yet been established. If a symptomatic hepatitis does develop, the first signs of illness (e.g. weakness, arthralgia, myalgia, or vomiting) are not very specific. These may be followed by symptoms more typical of hepatitis such as the mentioned symptoms in the case of our patient, like jaundice, pruritus, and hepatic encephalopathy. The disease is generally self-limited and harmless, but occasionally severe hepatitis E may progress to acute liver failure (9). Antiviral therapy with ribavirin in immunodeficient patients with severe or chronic course is possible (10). Our patient did not have a pre-existing vaccination which is recommended for some endemic countries in, e.g., Africa and Asia (China) (11). HEV has been proposed as potentially trigger autoimmune hepatitis (12). A case of acute hepatitis E-associated signs of autoimmunity (i.e. increase in ANA-titer) was recently reported (13, 14). Also, one must consider the possibility of HEV inducing serological abnormalities such as hyperimmunoglobulinemia, possibly through polyclonal stimulation mimicking AIH. The mechanism of non-specific reactions to a viral infection or even a specific reaction to a definite HEV strain that could trigger AIH need to be further clarified (15). We speculate that the mechanism, through which the virus can trigger AIH besides molecular mimicry, may be that HEV induces a defect in suppressor-inducer T lymphocytes specific for the asialoglycoprotein receptor, a surface receptor of the hepatocyte, which increases in autoimmune hepatitis and induces cell inflammation and hepatocyte apoptosis (13). HEV infection could have been alone a sufficient reason to induce acute liver failure. An antiviral therapy with ribavirin would have been recommended, as it is reported in severe HEV-related acute liver failure (16-19) to ensure rapid viral clearance and resolution. In the case of this patient, autoimmunity was diagnosed simultaneously, leading to an increased ANA-titer and hypergammaglobulinemia with histologically presence of plasma cells. We therefore decided to start a therapy with steroids, as we speculate that the real cause of acute liver failure in this case was the de-novo autoimmune hepatitis triggered by hepatitis E virus infection. According to the AASLD and EASL guidelines, prednisolone 60 mg/day followed by azathioprine is the adequate immunosuppressive therapy. However, from our clinical experience with patients suffering from highly elevated liver enzymes and pending loss of liver function, we decided to start with a high dose of steroids, and fortunately, the patient recovered totally. In conclusion, this case supports the initiating role of hepatitis viruses in the development of autoimmune hepatitis and probably other autoimmune diseases.